When browsing menus, learn how to spot unhealthy foods based on their ingredients. Creamy or cheesy sauces and salad dressings are loaded with fat and calories. 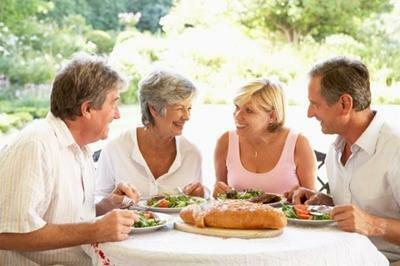 Active adults are typically conscious of their health and eating habits, yet making the best choices can be challenging when dining out. Fortunately, many restaurants are beginning to print nutritional information right on their menus and those that don’t may have the information available upon request. Even without this information, you can often make better choices by following some simple guidelines. Finding the healthiest items on a restaurant menu can sometimes be counter-intuitive. Salads are not necessarily a safe bet, as some restaurant salads contain over 1,200 calories. The best route is to patron restaurants which offer nutritional information for each of their meals. Many restaurants have this information listed on their websites, which lets you plan ahead before you leave home. Several smartphone apps are designed to help you make healthier food choices both at home and when dining out. These apps have their own databases with nutritional information for well-known grocery store items, as well as the menus for many popular fast food and chain restaurants. If you use one of these apps on your smartphone, you can easily bring this information with you every time you go out to eat. When nutritional information is not available, you can still make smarter choices at restaurants by following a few simple tips. To begin, cut out the high-calorie sodas and get used to drinking water with your meals. Many restaurants serve water with a slice of lemon or lime to make it more appealing. You can also splurge on sparkling water or mineral water if you want a little something special. Iced tea can also be a good choice, as long as it isn’t sweetened with sugar. When browsing menus, learn how to spot unhealthy foods based on their ingredients. Creamy or cheesy sauces and salad dressings are loaded with fat and calories. Items that are high in starch, like pasta and white potatoes, are also packed with more calories than you may realize. You can often shave off many calories by simply ordering foods without calorie-rich toppings like mayonnaise or sour cream. In addition to avoiding certain ingredients, you should be aware of how the cooking process affects the nutrition of your meal. Foods that are fried are full of fat, particularly if they’re breaded (or batter-dipped) and deep-fried. Look for healthier choices like lean grilled meats and fish, and grilled or steamed vegetables. And skip the bread and butter or it will add hundreds of calories to your healthy entree. Once you take the time to compare nutritional information and begin tracking your calories, it’s easy to see which foods are healthier than others. Dining out can be a challenge, but it doesn’t have to stop you from enjoying the benefits of healthy eating.